-The oldest age recorded for a dog was 29 years, 5 months for a Queensland 'heeler' in Victoria, Australia. -The average dogs mouth exerts 150-200 pounds of pressure per square inch. Some dogs can apply up to 450 pounds. 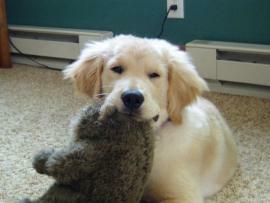 -Puppies cannot control their bladders overnight until they are at least 4 months old. -A one year old dog is physically as mature as a 15 year old human. -When a dog bays at the moon, it is following a basic instinct to call the pack together. -Staring directly into the eyes of a strange dog may be interpreted as a challenge and may encourage the dog to bite. -The normal body temperature of a dog is 101.2 degrees Fahrenheit. -Dogs only have sweat glands between their paw pads. 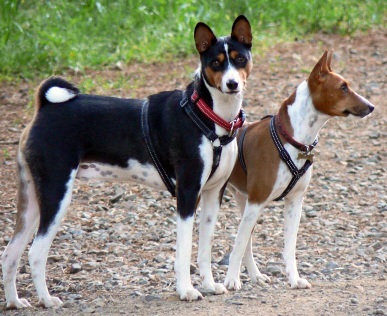 -The Basenji is the only breed of dog that cannot bark. -A dog can run up to 19 miles per hour at full speed. Members of the greyhound family can run up to 42 miles per hour. -Approximately 1 in 3 households own a dog. -Dogs have been wearing collars since the Egyptian times. -If never spayed or neutered, a female dog, her mate and their puppies could produce over 66,000 dogs in 6 years. -During WWII, Russians trained dogs to run suicide missions with mines strapped to their backs. -Three dogs survived the sinking of the Titanic: A Newfoundland, a Pomeranian, and a Pekingese. -An estimated 1,000,000 dogs in the U.S. have been named as the primary beneficiaries in their owner's will. -Dogs have the ability to sense health problems in humans. They can naturally tell when a child has autism, and can also be trained to predict epileptic seizures. -Wolves and dogs can mate and produce fertal offspring. -A dog's heart beats up to 120 times per minute, or 50% faster than the average human heartbeat of 80 beats per minute. To view my sources, click here.